Farrar, Straus and Giroux (BYR), 9780374351311, 40pp. As soon as the teacher starts to play his guitar and sing, the kids are whirling and twirling and having a blast. But for one hesitant little music maker, it is all a bit overwhelming at first. With energetic and bright illustrations, this reassuring story about the courage it sometimes takes to try something new will resonate with children everywhere. 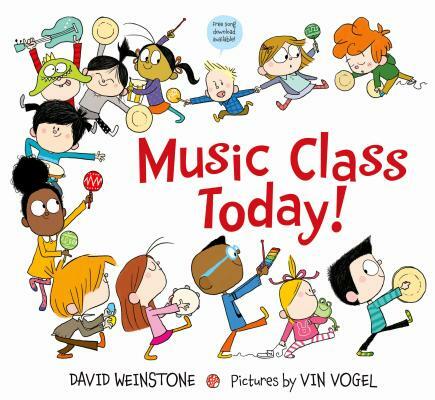 From David Weinstone, the creator of the wildly popular Music for Aardvarks program, and the pitch-perfect Vin Vogel comes this infectious celebration of music class that will make you want to sing and dance with your own little ones! DAVID WEINSTONE is a classically trained former punk rocker who lives in Brooklyn, New York, with his wife and three children. He founded Music for Aardvarks and Other Mammals, an interactive music class for preschoolers, in 1997. Today, the classes are taught all over the country, and there are sixteen original albums that feature Weinstone's beloved songs. His books include Music Class Today! and All My Friends Are Fast Asleep. Vin Vogel is a Brazilian-born author and illustrator based in New York City. He has illustrated many books for children and young adults, including Maddi's Fridge and The Thing About Yetis.